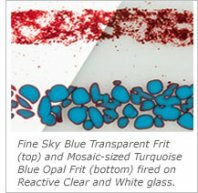 Thick 5mm glass is used to build up thickness without using multiple layers of standard thickness glass. This eliminates bubbles and "eruptions". Useful for making plates or heavier fused items. Spectrum's Aventurine Green is a deep emerald that develops a unique crystalline, metal flake appearance after coming to fusing temperatures. GRAY, BRONZE AND CHAMPAGNE TRANSPARENT SHEETS, 8x12"
The Oceanside factory has told us that they are not producing iridized styles in the foreseeable future. CLICK HERE TO SEE OUR REMAINING SELECTION. NOTE: The samples shown are good approximations of the actual colors you will receive. Like all other colored glass products, colors may vary batch to batch and like any image on the internet, the shades you see above depend on your computer's video settings.